The whole experience was fun for me. Getting to the airport, looking around the shops, the take off, watching a movie, reading a book, even the in-flight meals. And for that reason I'd always land feeling fresh and ready to go. However, nowadays it's a totally different story. Because since my back problems began, flying has become a total ordeal for me. So much so that I dread it for weeks in advance because I know the torture that is coming. As being crammed into an uncomfortable seat with no leg room for hours on end and being forced to get far more intimate with my fellow passengers than I'd like is no longer my idea of a good time. And what's even worse than that is the increasing pain and tension that builds in my back and body as the hours tick by. Which leaves me feeling broken and exhausted when I land at the other end and this can take me days to recover and feel like myself again. And it's not just me either. As in a survey by Spine Universe it was found that 87% of people said that their back and neck pain became worse after taking a flight. Which is almost enough to make you give up long haul flights for good right? But for me my love of travel and seeing the world always wins out​. And I'm sure yours does too. So I've searched out 20 tips for us all to follow to give ourselves the best possible chance of surviving our next flight with the minimum levels of discomfort and pain. These include things you can do before, during, and after the flight to keep your back happy (or at least happier!) on your next vacation. So, if you've got an upcoming trip planned try them out for yourself and see if they make a difference. Your summer break is almost upon you and you are feeling so excited. As blissful scenarios are playing out in your head of sunny beaches, inviting oceans, beautiful sunsets and delicious cocktails. However, there's a dark cloud on the horizon that's threatening to spoil the party. And that is the upcoming flight to get there. But instead of wasting time worrying about it be proactive instead. Because there are plenty of things you can do to ensure you arrive at the airport in the best possible shape to conquer those back pain demons. And I'll take you through them now starting with your pre-flight preparations. Stopping over for a night in the middle of a long haul flight can make a massive difference. We all want the best deal when it comes to booking our flights don't we? So I'll shop around for hours trying to save a few bucks before committing myself. After all, every dollar you save on your flight is an extra one to spend in the bar right? However, if this means a 36-hour trip, having to change planes 2-3 times and wait for hours in 3 different airports then are the savings really worth it? Certainly not when you weigh it up against the torture that you will put your back through. So when you are planning your next trip by all means shop around for a great deal, but also consider being as kind to your back as you are to your wallet. Booking yourself onto flights at off-peak times as these will have more empty seats, giving you more room and allowing you to stretch yourself out. Also booking yourself the aisle seat means you can get up and move around easily during the flight, while also giving you more room if you're tall. Consider breaking long haul flights up by taking a stopover if you have time, as a night in a hotel can turn a grueling 14-hour flight into 2 more manageable 7-hour flights with a nice rest in between. Get something to help you to relax and ease your pain mid-flight. Sometimes your body needs a little help to relax and withstand the pressures that flying can bring. So take a supply of over the counter medications with you to help take away the pain and ease you through. As drugs like Tylenol, Advil, Aleve, Motrin, and Ibuprofen can all help you to relax and fight off inflammation. And by taking one an hour before your flight it will be in your system by the time you take off (so a pre-emptive strike!). Just keep a couple of things in mind when travelling with medication. Always keep the medications in their original bottle or packaging to avoid any mix-ups at airport security. And make sure they are legal in the countries you are flying to (you might be surprised, and not pleasantly!). And it goes without saying, but always check with your doctor before taking any pain medication to make sure it's safe for you to do so. This guy doesn't look convinced! Now this one is optional and is perhaps best left for those with more serious back conditions. However, it can be a big help to have a doctors note outlining your back issues for a couple of reasons. Firstly, showing it at the check-in counter and to the flight attendants as you board will make them aware of your needs and they will do all they can to accommodate you. This could be by providing you with extra pillows and blankets or moving you to a more comfortable seat. I saw this work first-hand on my last flight. As the flight was only three-quarters full they allocated space for one guy with a doctors note for his bad back to take the whole 4 seats in one of the middle aisles so he could lay down. Which was a right result for him as it was a 12 hour flight. He slept like a baby! And who knows, if you're supremely lucky and the flight is fairly empty you may even blag an upgrade. It can be really tempting to use our hand luggage to carry stuff that we can't fit into our suitcases. But the problem with this is you then have to lug this bag around the airport with you for a couple of hours before the flight. And if it's really heavy it's going to strain your muscles and tire them out before you're even on the plane. Being a minimalist will definitely work in your favour here. A boxer doesn't just step into the ring and rely on his skills and instincts to get him through a big fight. They spend many weeks beforehand getting their body into the perfect condition for what's to come. And you should be doing the same when it comes to your flight. Because by staying active, strengthening your core muscles and stretching regularly in the weeks leading up to your flight your back will become more flexible, better supported, and able to withstand the pressures of air travel. Now doing these 3 things regularly is great advice in general anyway, as they are crucial to staying on top of your back pain. And if you already do then kudos, you will be ready when the big day at the airport arrives. But if you are someone that doesn't get enough exercise, try and introduce some gentle activity in the fortnight leading up to your flight. As just something as simple as taking a daily walk and stretching a couple of times each day can make a massive difference to how you feel on your flight. And for some ideas of gentle daily stretches and movements you can do to make your body more flexible check out the video above. Ok, so now you've prepared yourself for your flight like a pro and are ready for take off which is great. Because once you're on board the battle has well and truly commenced. And as this battle is fought for hours and hours on long-haul flights it can leave you mentally and physically shattered by the time you land. So make sure you are fighting the good fight by doing as many of the following as possible during your flight. Don't injure yourself before take off! Hopefully if you've followed tip number 4 then your carry-on bag won't be too heavy. But if it is then you need to be careful when putting it up into the overhead lockers. Because if you do this wrong ​and tweak your back it's game over before the flight has even taken off! So make sure you lift your bag safely and carefully. Also don't twist your body while you are holding it, pivot with your feet instead. And if you're worried and your back is already feeling painful ask someone on board to put your bag away for you. One of the main reasons your back pain worsens on long flights is because you are forced to sit down in the same position for a long time. And this is one thing that your body hates! As prolonged periods of sitting have been shown to lead to the development of lower back pain. This happens because when you sit your vertebrae become compressed and your core muscles that support your back remain inactive. Which leads to a weakening of both your spinal discs and these supporting muscles, which places your back and spine under increasing strain and pressure. And this effect is amplified during flights because of the vibrations of the plane which are constantly being absorbed by your body. Now it may not surprise you to learn that airlines design their seats so they can get as many paying customers onto a flight as possible rather than for your comfort and health. Which means these seats really hard to get comfortable in as well as being really hard to sit in with a healthy posture. And when you add in the limited leg room for us tall folk it can feel almost impossible to relax and sit correctly. Firstly, try to book a seat which comes with extra leg room such as one in an exit row. Keep you spine and neck in alignment by sitting up straight with your shoulders back. Recline your seat slightly to ease the pressure on your lower back. Keep your legs in alignment with your hips at an angle between 90-110 degrees. Also keep your knees at a 90 degree angle. Keep both feet on the floor as this helps to support your body weight and takes strain off your back. And watch the video above as this runs through a few extra tips for sitting healthily in your plane seat. To maintain a good sitting posture you should be aiming to sit in a way that maintains the natural 'S' curve of your spine. However, as I've already mentioned airplane seats can make this difficult to do. So consider taking a lumbar support cushion with you . As these cushions are great for helping you to sit with and maintain a healthy posture. Because by placing one between your lower back and the seat your spine naturally adopts the correct curve which reduces the strain and pressure on it. 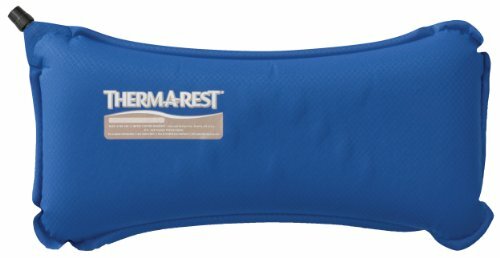 And a great one for air travel is the Therm-a-Rest Lumbar Pillow. Because this is inflatable, which means it's light and easy to carry around in your carry-on bag as it can be rolled up into the size of a can of soda when deflated. And it self-inflates so you don't need to worry about bringing a pump or blowing yourself out! You can also adjust the amount of air to make it as hard or soft as you like. And another good idea to keep your spine in alignment is to use a neck pillow. As neck pain is just as common as back pain when flying and it can be so easy to crook your neck by sitting or attempting to sleep in awkward positions. 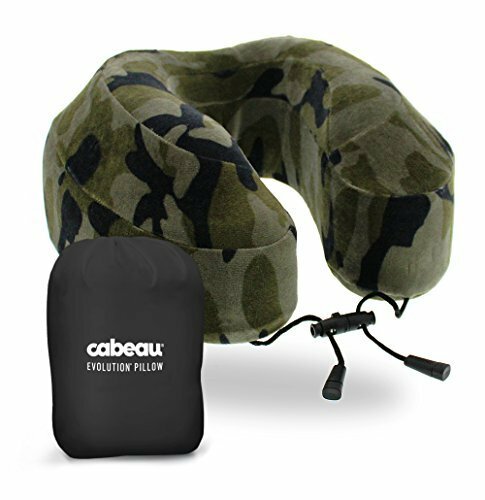 So get yourself a neck pillow such as the Cabeau Evolution Memory Foam Travel Pillow for your next flight. As not only will this help to ward off neck pain, it'll also keep you more comfortable and relaxed. So you'll have a better chance of getting 40 winks too! As I've already mentioned sitting down for long periods in the same position is a nightmare for your back. However, a great way to limit these effects is to take regular microbreaks from sitting by getting up out of your seat and moving around the plane. As this will help to keep your spinal discs healthy by decompressing your vertebrae. And by engaging your back supporting muscles again they have less chance of weakening. So try to get up out of your seat for 5 minutes at least once per hour on a long flight (this is much easier if you have an aisle seat). However, be aware that just getting up isn't enough. As you need to move and mobilise your body to get your muscles working and the blood flowing again. So walk up and down the aisle a couple of times and do some stretches like the ones in the video above (the back of the plane is usually the best place for this). As this will help to break up the flight and keep your back healthier in the process. Now getting up out of your seat for a stretch and a walk every hour is a great way of staying out of pain on a long flight but it may not always be possible. For example. if your flight is a turbulent one then the seat belt sign may remain on for hours at a time and prevent you from getting out of your seat. So in cases like this it's important to practice small stretches while you are sitting. As this will help to relieve the build up of pressure and tension in your body that sitting in the same position brings. ​So check out this article that explains a few nice stretches you can do when sitting down on a plane. Or check the video above. And don't be afraid to fidget! Because even these small movements work to keep your muscles active and can also minimise the risk of developing deep vein thrombosis during a long flight. During a flight your back muscles can become stiff, sore and tight, which can leave you in a lot of pain and discomfort. However, a good way of easing this pain and getting these muscles to relax is by applying heat to them. Increase blood flow to the area which helps to deliver oxygen and nutrients that help your damaged muscles to heal. Override pain signals to the brain by stimulating the skins receptors with the heating sensation. Encourage the release of endorphins which are the body's natural painkiller. Relax your body and leave you feeling comforted by the warming sensation. Now this isn't as easy to do in the air as it is in your own home but there are some great options ​still. And one I'd recommend for flights is using a heat wrap or pad such as the Thermacare Heat Wraps. 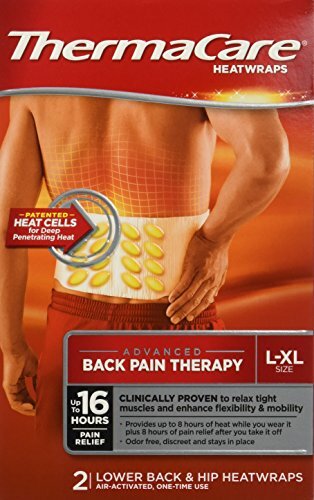 As these fit nicely under your clothing and will keep your back muscles warm for hours on end. So perfect for those long journeys. You're not going to look like this going through airport security so don't bother trying! Some people just make flying look effortless don't they? For example celebrities such as the Beckham's get papped getting off a 14-hour flight and still look like they've just stepped off a photo shoot. However, don't be tempted to go for gold and emulate the fashionistas. As your back will get so much more benefit from wearing comfortable clothes instead during a flight. Because this will allow your body to move freely, relax fully, and feel at home rather than be sat tense and upright in your fancy gear. And spoiler alert: The Beckham's probably haven't ridden economy for over two decades and take a shower and change outfits in the first-class lounge before facing the cameras. So don't feel bad strolling through to baggage reclaim in your comfy old tracksuit. Be content that you feel relaxed and healthy instead. When we are stressed, tense and anxious we tend to hold this tension within our muscles. You've probably felt this yourself, as your shoulders hunch up and your lower back tightens when you feel stressed. So it makes sense to learn how to relax and release this tension and nowhere more so than on the plane. Because the whole business of travel is stressful and you are more than likely going to feel a bit frazzled by the time you board your flight. Take off your shoes - this is simple but really effective and it can also help you to avoid contracting deep vein thrombosis. Try foursquare deep breathing - close your eyes and breathe in for 4 seconds, hold for 4 seconds, exhale for 4 seconds, hold for 4 seconds, and repeat until you feel nice and calm. Or 4-7-8 deep breathing - close your eyes and breathe in for 4 seconds, hold for 7 seconds, exhale for 8 seconds, and repeat until you feel relaxed (see video above). Meditate - Now this one takes prior practice but if you are familiar with meditating then it's a great way to relax during your flight. Use visualisation - again this one takes a bit of practice but it can work well. Close your eyes and visualise being in a calm and happy place such as a beach or the countryside. Now expand the fantasy and notice and feel all the small details of the scene. This will take you far away from your pain and into a happy and relaxed state of mind. And if you're one of those lucky few that can sleep on planes then even better. Staying hydrated is important for everyone but especially for those of us who suffer with persistent back pain. Because the water you take in helps to keep your spinal discs healthy and working as they should. Nourishing your cells and organs. Helping you to digest food. Eliminating waste and toxins from the body. Keeping your brain functioning well. So drinking water regularly is a great habit to get into. And it's even more important during a flight, as the low air pressure inside the cabin can dehydrate your body much more than usual. So drink plenty of water during the flight to keep your back on the right track. But while drinking water is good remember to limit alcohol and caffeinated drinks as these can dehydrate you even more. When your back is feeling stiff and painful it can be all you can think about. So it completely takes over whatever you are doing and makes everyday tasks a real struggle. However, there are ways you can consciously distract your brain away from this pain and limit it's hold over you. This is possible because your brain only has a limited capacity to be able to take in the overwhelming amount of sensory information that surrounds you. So it has to focus on what it feels is the most important information and unfortunately pain sensations are usually at the very top of this list. However, if you give your brain something else to focus on instead you can move your attention away from the pain. Because when you are absorbed in another activity your brain doesn't have the capacity to listen to the pain signals as well. So distracting yourself is a great way to get temporary relief from pain and this works best with things you really enjoy. Buying a book that interests you at the airport to get stuck into. Watching one of the in-flight movies or downloading a box set to your laptop/iPad. Listening to one of your favourite albums. Downloading a few podcasts to listen to during the flight. As keeping your brain occupied can block the pain signals and enable you to enjoy your flight a lot more and feel much more comfortable. And doing something you enjoy will also encourage the release of endorphins, which will improve your mood and help to fight off pain. If you've followed the tips up till now then hopefully you'll be leaving the airport feeling this happy too. Once you land at your destination it's all about recovering your body and mind as quickly as you can so you can feel like yourself again and fully enjoy your vacation. So don't just get to the hotel and flop down on the bed. Try to do the following to give yourself the best chance to recover a lot faster. Your body and muscles will most likely feel tight and less flexible after a long flight. I know personally that I can feel stiff and sore for days after travelling. However, if you don't do anything to rectify this then it can have knock-on effects for your posture and place your lower back under extra pressure and strain. So when you check in to your hotel room have a good stretch. As this will help to release the build-up of tension in your muscles and get the blood circulating again. So any of the stretching routines I've featured here (or any of your own) will work just fine. But if you want some ideas specifically designed for after flying take a look at the video above. Get your bearings and get your body moving again. Similarly to stretching, going for a walk will also help you to get rid of the tension that has built up in your body. As it'll get your blood pumping and your body moving again. And let's face it, who doesn't want to nip out and explore their new surroundings when they first arrive in a new place? So when you arrive at your hotel have had a good stretch, drop your bags, and go for a walk to get some fresh air into your lungs and energy into your body. And if that walk happens to end in a bar selling a nice cold beer then all the better! Don't forget to pack your rubber duck. So you've had a stretch and a walk and a nice cold beer. Now what? Well a nice hot shower is always a good idea, as it's refreshing and will help to invigorate and energise your tired muscles. However, if your hotel room has a bath then take advantage and have a nice hot soak instead. As the heat will help to relax your aching muscles and mind after a stressful day of travelling. Which will leave you feeling loose, comfortable, and free from pain. It'll also help you to get into a relaxed state that will allow you to get some sleep, which can be difficult after flying. Especially if you're passing through different time-zones and feeling jet lagged. Everything feels better after a good night's sleep right? And this includes your back after a long flight. Because it's during sleep that your muscles and body heal and regenerate themselves to get you ready for the following day. And it also calms your central nervous system, which helps to keep you mentally and emotionally healthy. So there's nothing better after a long flight that has left you feeling physically and emotionally drained than to get a good night's sleep. Let someone else work out those tight muscles. If you're still aching and stiff when you wake up the next morning consider getting a massage. Because massages are great for releasing muscle knots that cause you pain and tension. As by stimulating these tight knots the masseuse encourages them to release. Which allows blood to circulate to the area, waste and toxins to be flushed away, and your damaged muscles and tissues to heal and repair. Also a good massage can also help you to feel relaxed and get your emotions back on an even keel after the trauma of the travelling experience. And the good news is that massages are usually a lot cheaper in countries people vacation in than from where they are flying out from. Because your back will definitely feel the benefits and it will help you get over the last lingering pain from the flight. Don't let the site of a plane strike fear and dread into you. Flying can be a nightmare experience if you suffer from back pain. As the uncomfortable seats, air pressure, vibrations from the plane, stresses of travelling, and the cramped environment can all lead to you arriving at your destination feeling like a physical and emotional wreck. Because by getting into good habits before, during, and after your flight you can arrive at your destination feeling relaxed and comfortable instead. Which will make the prospect flying off on your next vacation a far more pleasant experience. And if you have any other tips that have helped you in the past I'd love to hear them in the comments below.